Brighton boss Chris Hughton admits having Lewis Dunk unavailable for their Boxing Day game at home to Arsenal is “very frustrating”. Dunk was the victim of mistaken identity when he was booked for a foul in Saturday's 2-0 defeat at Bournemouth, with television replays showing that teammate Yves Bissouma should have been cautioned for a foul on David Brooks. 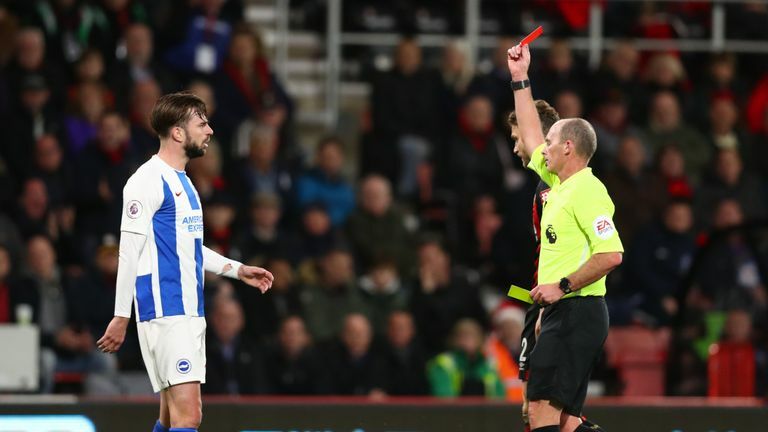 A subsequent yellow card for Dunk in the same game saw him dismissed and Hughton will now be without a key performer for the home game with Arsenal on December 26, with current rules stating only red, and not yellow cards, can later be rescinded. "It's very frustrating," Hughton said ahead of the match - live on Sky Sports. "At the time we weren't too sure because of the distance away [from the incident]. "You assume the referee has got it right but we saw Lewis' reaction afterwards and when we spoke to him and saw it again, it became clear that if anybody was going to get a yellow card, it was Bissouma. "'Can or should they change the laws?' Probably, although mid-season is not the time to talk about it. But it's certainly very frustrating from our point of view. 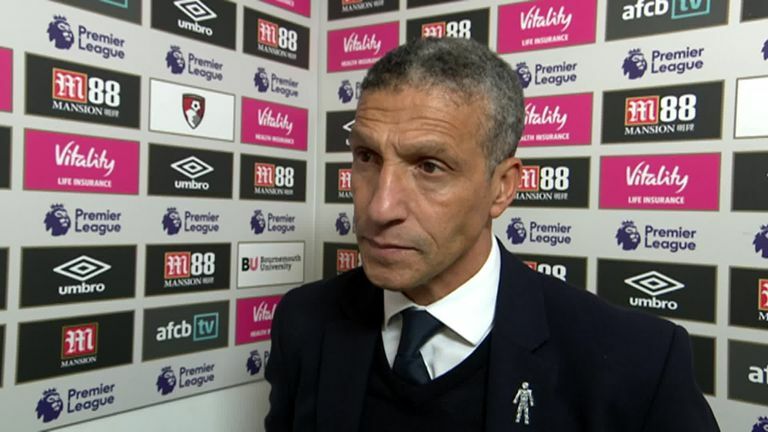 Brighton manager Chris Hughton feels Lewis Dunk was unfortunate to receive a red card in their 2-0 defeat to Bournemouth. "We will miss a player who has been a mainstay for us, not only this season but also in previous seasons." Brighton's defeat at Bournemouth means they have now lost three Premier League matches in a row. Hughton remains in a positive mood, however, although he refused to concede they are already safe from relegation, especially with a tough run of games coming up that includes Liverpool at home and Manchester United away on consecutive weekends in January. "I don't think we can afford to look that way [on Premier League safety]," added Hughton. "Palace got a great result at the weekend [a 3-2 win away to Manchester City] and I can reflect back on Huddersfield last season from the position they were in but put a string of really good results together. "The best way for us to think is that we have got really difficult games coming up but that we can get points. You have to go into every game thinking you can get something from the game. "We've lost three in a row, but we won three in a row a few months ago. To do that was huge - and that would have gone a long where to contributing to where we are now. Arsenal face a Boxing Day trip to Brighton as they look to maintain their hunt for a top-four spot, live on Sky Sports Premier League. "This busy period gives us a good opportunity to pick up points - but we never set specific points-total targets from matches. We're at home for the next two [Arsenal on Boxing Day and Everton on December 29], but they're very tough matches." As for the Arsenal game, Hughton admits the 2-1 home victory over the Gunners in March proved to be a key moment in their first season in the Premier League. Hughton said: "It was a breakthrough for us. You look at pivotal moments in any season - one was getting our first win at the Amex, then our first away win and then our first win against a top-six team. 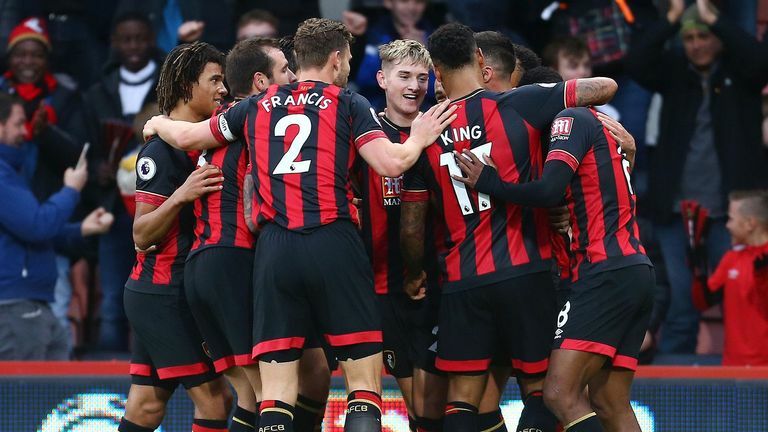 Highlights from Bournemouth's 2-0 win over Brighton in the Premier League. "We'd found it difficult - we played Manchester City on the first day of the season and that was a very tough game, and Chelsea was a difficult game as well. "The Arsenal win was a fairly significant moment for us and one that we deserved."